I love sushi. I mean I loooooooove sushi, so it's a good thing that Knoxville's got more sushi restaurants per capita than any other city in the South. Ok, I'm making that up, but I'm willing to bet it's not far off. Seriously, five sushi places in a 1.5 mile stretch of Kingston Pike in Bearden? I love Nama just like everyone else, but I don't like having to wait an hour plus just to sit down and wait another half hour to get my sushi fix. I was really jazzed about Nama Bearden because it's close to where I live, it has good parking and the space is so much bigger than Nama v1.0. I usually ended up going to Tai because it was close and had a pretty good sushi and drinks menu. Not to mention it was never crowded. And then Tai closed, which I'm sure had something to do with the whole never crowded thing. 1. Dunkin' Donuts is moving into an empty building on the same Kingston Pike block where you can find McDonalds, Dippin' Donuts and IHOP. If I were a betting woman, I would say this probably spells trouble for Dippin' Donuts. I like Dippin's doughnuts, but their coffee is pretty bad, and if there's one thing Dunkin can do, it's coffee. This sign has been up for a few weeks with a trailer parked out back, yet no construction seems to be happening. 2. Knoxify has the lowdown on the new boardsports shop on Bearden Hill, The Board Room. This looks like a really cool place. I hope it succeeds. It depends on the state, but bars and restaurants that sell liquor have to pay ___ percent of all alcohol sales to the state through the gross receipts tax. I dont know the percentage amount in TN. So maybe they're behind on taxes? I'm no insider but I hear the ownership will remain the same. I heard this because we have always hosted our boot camp parties at either Tai or Koi, owned by the same people. If the ownership is the same, then maybe it's something left over from Tai. I agree, how many sushi places do we need in Knoxville? Tomo is my fav, but I really liked the atmosphere at Tai - and yes, the never crowded thing was part of the appeal to me as well. The Fish Bowl sushi restaurant inside Purada is run by the original chef from Tomo, so the sushi is just as great as Tomo. I went on a Monday night when they had half-price sushi and $1 sake and it was really good. I hope Sobu opens up soon...and I hope that Dunkin Donuts has a drive thru! 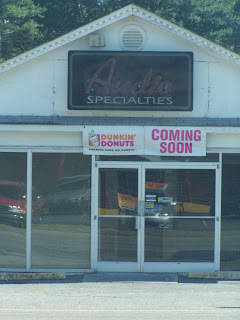 I'm arriving late to this party, but didn't the Dippin' Donuts location on Kingston Pike used to be a Dunkin' Donuts? If they couldn't make it in that area before, it sort of begs the question why they think they'll be successful this time around -- especially with the increased competition! LisaAnne: That's a good question, and it would predate my existence in Knoxville. Can any of the natives answer that? I will say this of Dunkin': They've made a lot of changes in the past few years, and you might be surprised at what they have to offer. The new stores have way more than just doughnuts, and some stores are actually DD and Baskin Robbins combined, though I don't think that will be the case with this one. Sobu opens officially this friday. feel free to stop by for the opening party thursday nite at 6 too. Actually, Sobu is owned by the same owners as Tai and the it also has the same setup as Tai. Tai was a great restaurant but the owners decided they wanted to change up the building and when they closed for remodeling, they decided to change the name too. It has some of the same food as Tai as well as a more sophisticated menu. The sushi is better than any Nama or Tomo sushi you can find. It's a great place with an awesome new atmosphere! I only say this because I don't want people thinking we closed down because of Nama of all places. We're our own brand of restaurant, not an overpriced sushi lounge. :) Come by and check it out sometime! If you liked Tai, Sobu will knock your socks off! Sobu is indeed open boasting an amazing new menu. Roast Duck, Filet Mignon, and Roasted Sea Scallops are just a few of the magnificent new additions. The new sushi menu is one to rival major city eateries and I have not found anything remotely close to it anywhere in the vast sea of sushi restaurants that are in knoxville. The atmosphere is similar to Tai with the now famous Buddah in the center of the dining room, but improved upon with a new sushi counter spanning the length of the room that used to just be a glass window showing the kitchen. Also of note are all of the new lights. Evening dining at Sobu is enhanced by a continuous, yet unobtrusive, colorwash which seems to change the entire mood every 10 mins or so. For those that remember the lounge side, it too has improved featuring a host of new furniture and curtains, creating a much warmer and inviting ambiance much more fitting for a place that is meant to 'lounge'. The back patio is the only part of Sobu that puts one off. It is apparently unfinished and dark. It is my great hope that they take the same care and creativity in getting this part of the restaurant up to par. I would personally like to see improvements such as better patio furniture and possibly some type of weather protection over the veranda. All things said, Sobu has some marked improvements over it's predecessor Tai. The menu is much more varied and prices are unbeatable for the quality and creativity. The building which was already a marvel has been improved just enough to breathe into it new life. On par with Knoxville's top restaurants like the Orangery or Regas, Sobu is indeed something to experience. Let's show it some love so it will stay around!!!!! Knoxville, so why risk going here where there is a good chance of getting sick, or worse! I also received one of their $20.00 off coupons in the mail. Sounds like the same thing. The fine print, like any other coupon, stated reservation required. I made mine, they honored it, and I had an awesome time with my friends. Best Sushi ever! Great atmosphere! Great service! My friend who has never had Sushi really enjoyed it.By the way. I found the food to be outstanding quality and value for the price. My friends and I intend to make this a regular place to eat and hang out. 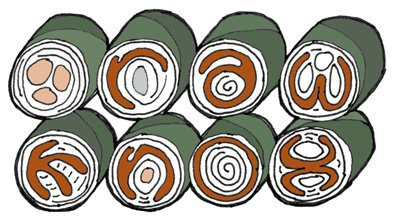 Sushi is one of my favorite foods, and I have tried it all over the country. Though my favorite sushi spot remains in NYC, Sobu is by far my favorite in Knoxville. I have eaten at Sobu several times since it has opened and have yet to be unimpressed. Their sushi (both selection and quality) is outstanding and appetizers are amazing. I am surprised it is not bursting at the seams with customers. If you haven't given Sobu a try, it's definately something to put on your to-do list.